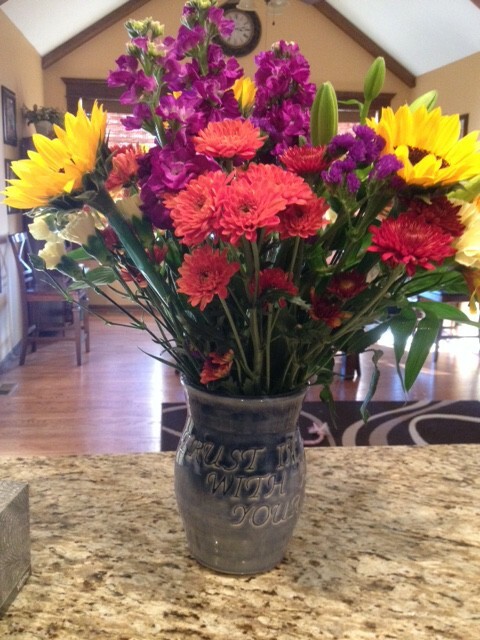 My daughter recently gave me a beautiful vase she made in her advanced ceramics class at high school. 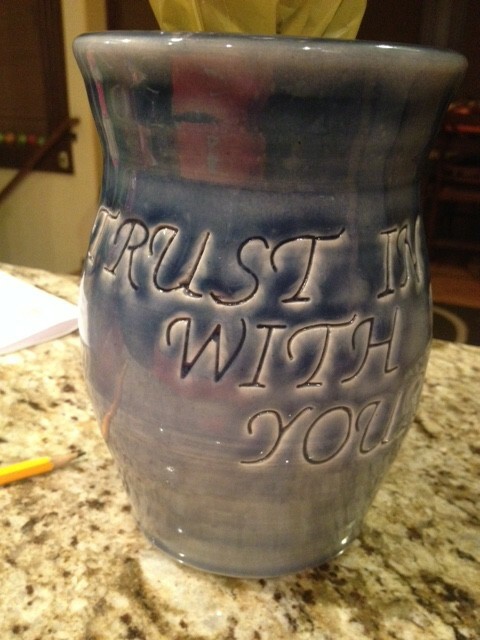 It was fired in a smoky blue glaze and hand-stamped with the first part of my favorite verse: Trust in The Lord with all your heart. (Proverbs 3:5) It came on my birthday and was full of colorful fall flowers that my family gave me. I loved it! As I stared at the detail of her finished work, I could picture her sitting at the wheel looking at the initial pile of clay. I recently visited her work room at school, and was invited to come throw a creation of my own, even though it had been over 20 years since I took a ceramics class in college. I remember how she helped me mix the powder and water in the pug mill until the right consistency was met. Then we each sat down with our kneaded pile of clay, and I learned how to center it on the wheel. As my foot pressed the pedal and the wheel began spinning, my hands became covered in the wet clay that I hoped would become something of value. But as I tried to remember the technique I learned so many years ago, I soon realized I needed guidance. By the end of the hour, I had failed at my attempt to create what was sitting in my head. But now my vision is back to her, sitting at the wheel preparing to create what would soon produce a huge smile on my face. Her hands press tightly around the unformed mound. The wheel begins to turn and the pile of wet clay is transformed, wide at first, and then pulled upward and out again to form a rim. She painstakingly bends over to shape every curve with her fingers and when the wheel stops, she works carefully to remove the vase with her tools. But she’s not finished yet, because now she begins the process of carefully imprinting the letters around the outside before the clay hardens. 32 letters in all; all pressed with precision and care. Then she waits. She waits for her teacher to fire her creation, so once it’s complete, she can apply the glaze. Then, it’s fired a second time. When the cooling is over, she sees the finished work she has completed and smiles. I’ve often heard the analogy of how God is the potter and we are the clay, and it’s true when people say that we are His vessels. But looking at my daughter’s irreplaceable vase, I now see things from a little different perspective. I see my daughter as the clay, myself as the potter, and my God as the teacher. I see her when she was a new-born baby, all limp and needing to be held a special way. I see her as a four-year old, with an “I can do it” attitude. I see her in elementary school, forming her own identity and beliefs. I see her in middle school, pulling away and moving up in the world. And I see her now as a Senior in high school, about to graduate, still growing in her faith and trying to figure out who she will become. God has allowed me to be her mom, and there’s nothing more impressionable in a child’s life than a parent. Sometimes we feel like failures, and we may see our attempts at parenting much like I did when I tried my hand at ceramics a few months ago. For the most part, though, we stick with it. We learn from our mistakes (and there are many) and we press on with God’s help. And while our journey of parenthood really never ends, there is that moment when we look at our child, thank God for His guidance, and realize how beautiful she has become.